This photo was taken on February 1, 2018 at 10:01 AM. The "Take It!" came after watching the "Skin" in the form of windows,be placed upon the outside of this luxury hotel which is under construction. Day by day I watched as some of the windows showed up having distortions in them. These distortions will provide a great opportunity for some strange looking reflection based photos in the future. I know not if this distorted glass will change the outlook for the rooms behind them, however - it certainly has influenced the inlook. The After Take: To pun lovers, my verbalizing of the question brought about a big laugh, To those who are not pun fans, Some expressed their disdain with huge eye rolls, which is always good for a laugh for all concerned. Wishing you laughter, from whatever the source, along with best wishes for a great day. 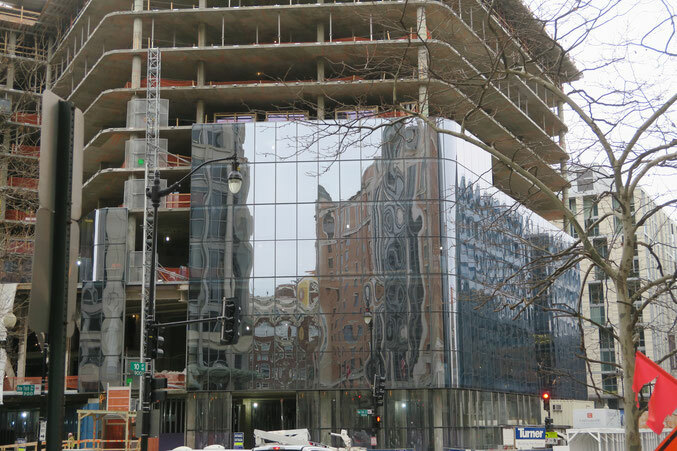 PS: Once this hotel is finished and open, I will stop by and make a visit to the lobby to see what decorating Items will be eye catching enough to take some shareable photographs. Skin, lol I like that. Oh I wonder what kind of hotel its going to be? When I was there last year it was fun to see all the new stuff constantly being worked on. It has more construction going on than any city I've ever been to. I love staying at new hotels and our school goes to DC every year. I'm going to have to remember this image and hopefully have the chance to check it out. It looks like they are putting up two way mirrors for the windows haha.